As expensive sterling moves out and a younger generation of less formal buyers moves in, a revamped rendering of an old favorite, pewter sees its resurgence. Pitcher, from B. Davis. Butter dish, available at B. Davis. Candlestick, by Vagabond House, available at Byron Cade. “Pewter is a wonderful metal, and one that’s becoming very high style,” says B. Davis owner Barb Davis. “The style, however, has changed dramatically since the '70s,” Davis adds, pining that this detail makes pewter all the more interesting to collect. Gravitation toward pewter, in particular, traces to a younger generation of shoppers – one that’s less formal and ornate than buyers past. “We don’t have time to polish things in today’s busy world,” says Nancy Bischoff, co-owner of Byron Cade. Pewter offers a low-maintenance, upscale solution for busy folks who still covet exquisite interiors. The metal – it’s 95% tin enhanced with small amounts of antimony and copper – comes polished, almost like silver, or in a matte finish. The latter, very rustic and Old World looking, has gained popularity, particularly in the realm of contemporary design, Knapp notes. Bischoff, too, notices a movement towards “the antique look you’ll get with matte,” particularly with young brides who prefer lines like Woodland and Ralph Lauren. And, while formality and delicacy may be on the decline, there’s one thing that hasn’t gone out of style: quality. Pewter is a durable metal that won’t rust or tarnish. Unlike silver, it improves with age and, because of its heaviness, won’t dent. “Pewter may darken slowly over time,” warns Davis, but she happens to like this mutation for its natural aesthetic. Davis likes pewter mugs and pitchers, and always has, because they condense to hold temperature. Knapp likes pewter best in the kitchen and bath where faucets have gone from chrome to pewter. Whatever you do, don’t hold your pewter hostage in a box or closed-off cabinet: use it! With a metal like pewter, the more you use it, the better the finish becomes. 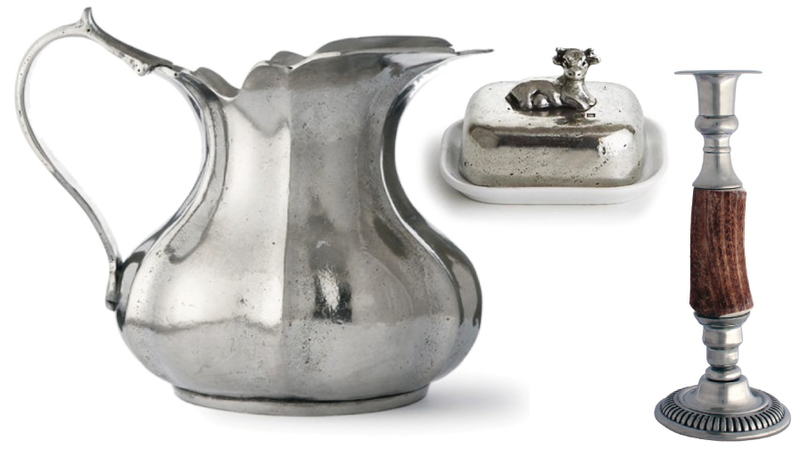 “You can display pewter in a beautiful way,” Davis says. Turn an old pewter pitcher into a vase; use pewter mint julep cups as sink-side vases in a guest bathroom, or incorporate pewter candlestick holders or trays into your mantel. The metal’s the most mixable material in decorating, according to Davis, who’s all about mixing: pewter with copper or gold looks playful and oh-so-lovely.